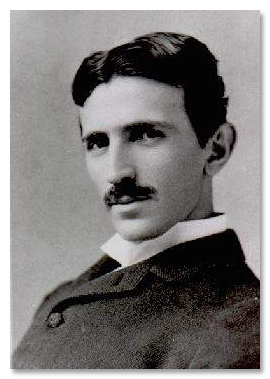 There was a great Western scientist named Tesla. He proved in science what we experience during meditation is the real emptiness. People refer to it by different names. They call it God, the Kingdom of God, the Buddha nature, energy or the Quantum theory. It is real, the void does exist. When we meditate, we empty ourselves of everything and enter into this real emptiness, the real substance of all things. From the void comes substance. It flows into our inner selves and makes us better and better and more intelligent. That was what Tesla was getting at. The real emptiness within is where all things come from. That is where you and I come from. Since we have already solidified into this form, we might just as well enjoy it. Tesla had proved, as many other scientists have, that all things are not solid the way we think they are. The Buddha also proved that our bodies are an illusion. They are nothing mysterious. It is all very scientific. When we look inside, we find nothing; we find no physical form, no substance; instead, we find a real existence, a real energy. That is where we come from. If we do not regard ourselves as a corporeal body, then we will realize that is where we come from. That is the real energy from which everything comes. That was what Tesla said. If we can communicate with this real emptiness, real substance, and separate it, then we can make every use of it and make anything out of it. We can run cars, airplanes and all else free of charge without having to use petroleum or to abuse the world's resources. Perhaps in the future, we will have more scientists who will prove that meditation is real. They can use scientific means to get the real substance out of the emptiness while we use our mechanical body and intelligent brain to derive energy from meditation. We will realize that is where we come from and where we shall return. We will understand that we were originally and essentially not a physical form. We have to use a scientific explanation to clarify mysterious aspects of spiritual practice - that these are no mysteries really.